(CNSNews.com) - The federal government collected a record $2,007,451,000,000 in total taxes through the first seven months of fiscal 2018 (October through April), but still ran a deficit for that period of $385,444,000,000, according to the Monthly Treasury Statement. In the month of April itself, the Treasury collected $510,440,000,000 in total taxes, while spending $296,192,000,000—thus, running a surplus for the month of April of $214,255,000,000. 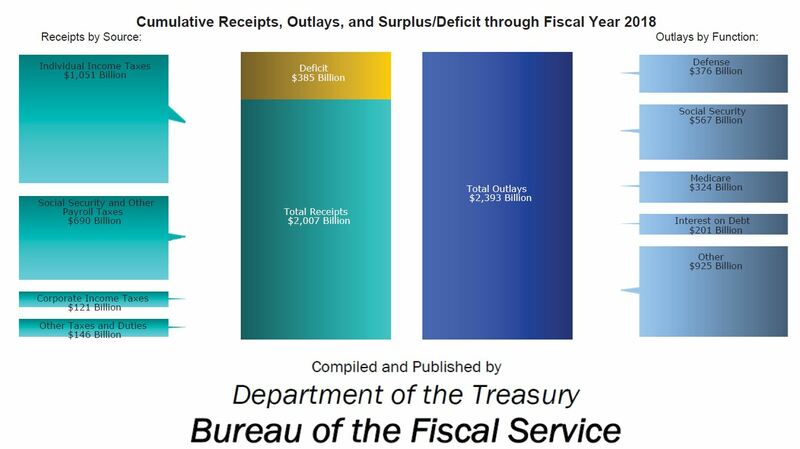 That monthly surplus decreased the fiscal-year deficit from the $599,708,000,000 it had been at the end of March to the $385,444,000,000 it hit at the end of April. April includes the filing deadline for federal income-tax returns and is often the month in which the federal tax collections peak. In 2017, for example, April was the No. 1 month for tax collections—with the federal government taking in $466,825,380,000 in total taxes constant April 2018 dollars. That was $43,614,620,000 less than the $510,440,000,000 in total taxes the Treasury collect this April. In fiscal 2017, the federal government collected $1,976,241,980,000 (in constant April 2018 dollars) in total taxes in October through April. 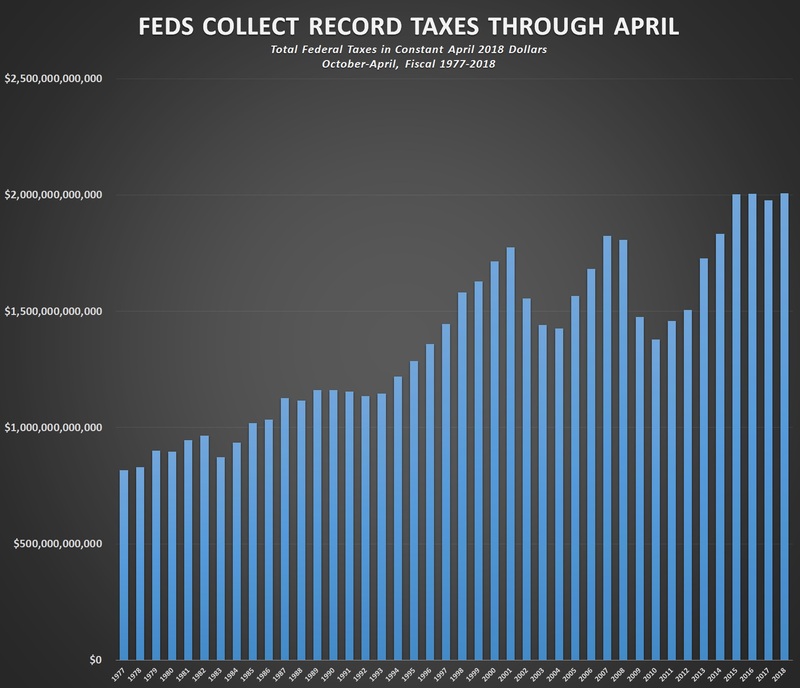 Prior to this year, the greatest total federal tax collections in the October through April period was in fiscal 2016, when the federal government collected $2,004,957,550,000 (in constant April 2018 dollars) in total taxes. Before this year, the greatest individual income tax collections in the October through April period was also in fiscal 2016, when the Treasury collected $985,215,720,000 (in constant April 2018 dollars) in individual income taxes. While total taxes and individual income taxes set records in the first seven months of this fiscal year, corporation income taxes declined. In fiscal 2017, the federal government collected $163,894,280,000 (in constant April 2018 dollars) in corporation income taxes from October through April. This year, it has collected $120,775,000,000. The record $2,007,451,000,000 in total taxes that the Treasury collected in October through April of this year included $1,050,601,000,000 in individual income taxes; $120,775,000,000 in corporation income taxes; $689,605,000,000 in Social Security and other payroll taxes; $48,370,000,000 in excise taxes; $13,716,000,000 in estate and gift taxes; $21,840,000,000 in customs duties; and $62,544,000,000 in miscellaneous receipts. The dollar amounts in this story were put in constant April 2018 dollars using the Bureau of Labor Statistics Inflation Calculator.